AstroCryptoTriviology: A Jones for MOL #2: 2 Cool 2 B 4 Gotten. A Jones for MOL #2: 2 Cool 2 B 4 Gotten. What is it about MOL, the U.S. Air Force’s 1960s “Manned Orbiting Laboratory” program (fig. 1), which keeps reeling me back in? Announced by Defense Secretary McNamara in 1963, endorsed by President Johnson in 1965 and cancelled by President Nixon in 1969, MOL was the unflown but extensively-planned rudimentary Earth-orbiting space station and reconnaissance test bed. By 1965, the man-in-space research on MOL was already being downplayed in favor of detailed Earth observations using the secret KH-10 “Dorian” telescope to be attached to the MOL (1). Figure 1. USAF Manned Orbiting Laboratory configuration in 1967. 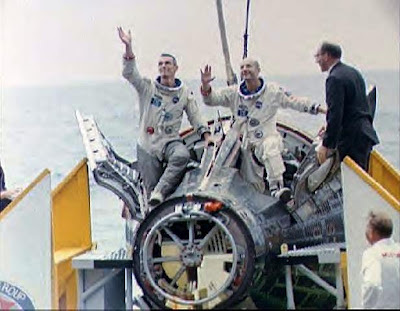 MOL would have used modified Gemini capsules for crew transportation in an era when NASA had moved on from Gemini to Apollo to carry astronauts to the Moon. These so-called “Gemini-B” capsules were to have several important but easily overlooked differences—simplifications, mostly—but one very dramatic complication: they would have had big holes in their heat shields. I have also blogged here about holes in the heat shields of space vehicles, and why they have been more common and less worrisome than you might imagine. The Gemini-B crew capsule would have had such a hole in the heat shield for its third hatch. Hatches 1 and 2 were the two large hinged doors, sized to permit ejection on rocket-propelled seats if necessary, and through which the pilots entered the capsule on the launch pad (fig. 2) and exited after splashdown (fig. 3). Figure 2. Large ingress-egress hatches on Gemini 4, after astronaut ingress before launch (credit: NASA). Figure 3. Large ingress-egress hatches on Gemini 9, during astronaut egress on the aircraft carrier deck after splashdown (Credit: NASA). This third hatch is probably the most well-known modification of the basic Gemini design for the MOL mission. It was really in two parts: a removable “crew transfer hatch” (fig. 4) which sealed the 24-inch (61 cm) diameter pass-through in the large pressure bulkhead—to maintain air pressure inside the capsule—and a separate “heat shield hatch” (fig. 5), the same size and also removable, which plugged the corresponding hole in the actual heat shield—to keep the 3,000-degree F (1650 degree C) plasma (2) safely outside the capsule during re-entry into Earth’s atmosphere at the end of the mission. Many people assume these two hatches were one and the same, but they weren't. Figure 4. “Third hatch” on Gemini-B. Bottom diagram shows the crew transfer hatch (labelled “Heatshield Hatch”--a common mistake) inside the crew cabin, where the storage compartment was located on legacy Gemini capsules (credit: John Fongheiser). Figure 5. “Third hatch” on Gemini-B. Actual heat shield hatch on exterior of re-entry vehicle of the unflown Gemini 3A capsule in the National Museum of the U.S. Air Force (credit: Steven Jones). As an Air Force spy satellite project, MOL was heavily classified, but as a manned program in the early “heroic” days of space exploration, there was inevitably much publicity in which some information was released, and much speculation in the absence of more information. This led to a tension between public curiosity and operational secrecy, both then and now. In recent years, many aspects of MOL have been declassified, but others remain secret. The men selected as MOL’s “Aerospace Research Pilots”(3) seem eager to discuss what they knew way back then, after long and successful aerospace careers following its cancellation in June 1969. They tread carefully lest they reveal still-secret topics, but several of them spoke on camera and on the record in “Astrospies”, an episode of the PBS series NOVA which aired in February 2008. Astrospies was an hour-long documentary on MOL and its Soviet counterpart based on work by investigative journalist James Bamford (4). Shortly thereafter, Dr. Dwayne Day published some clarifications of the Astrospies script as well as a good listing of previous MOL-related publications already in the public domain (5). He has researched and published extensively on spy satellites, and had collected much of the available documentation on the project during a visit to the Air Force’s archives at Maxwell AFB in Alabama in late 1999. Dr. Day (6) and Scott Lowther (7) have posted sales presentations given by the MOL’s manufacturer, the Douglas Aircraft Co., to NASA in April 1967 and May 1968. (Douglas was merged with McDonnell Aircraft Company, builders of the Mercury and Gemini spacecraft, in April 1967, but retained responsibility for MOL.) 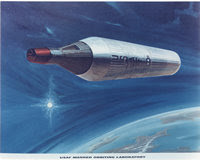 Douglas tried to interest NASA in some or all of MOL’s components for the agency’s pre-Skylab version of its first space station. Presumably these declassified charts and diagrams accurately reflect the habitable portions of MOL: Douglas would probably have tried to market the same mature design to a different customer, because redesigning for a possible (but unlikely) NASA sale would not have been cost-effective. Also, the secret aspects of the program had more to do with the reconnaissance payload at the aft end of the MOL stack than with the cramped living quarters for the pilots. In addition to his other contributions, I owe Dr. Day thanks for the title of this blog series. In addressing some on-line comments about the difference in the progress of records declassification between MOL and unmanned spy satellites, he wrote: “Despite the fact that lots of people have a jones for MOL, it never actually flew, meaning that it had little impact upon the Cold War” (8). During the 43 years since the project was cancelled, enough has remained secret that those of us with a “jones” for MOL must supplement documentation with deduction or even imagination. One long-standing question has been the orientation of the Gemini-B/MOL stack in orbit, while photographing Russian military secrets on Earth: was the 70-inch primary mirror of the powerful telescope aimed out the back end of the MOL, or through an aperture in the bottom side of the cylindrical mission module? From a human factors perspective, the question was whether the Gemini-B capsule was pointed up into space away from the Earth, so that its two forward-facing cockpit windows would have viewed only deep space while the telescope was in use, and its attitude was stabilized by the gravity-gradient effect. Or was it pointed forward along the line of flight, so that it flew nose-forward like a bullet or an airplane, requiring regular thruster firings to maintain its attitude parallel to Earth’s surface? Artists’ concepts and models have supported both attitudes, but a recently declassified document (9) makes it clear that images were to be obtained through a large opening in the side, meaning that the Gemini-B/MOL stack flew along its orbital path like an airplane (fig. 6). Figure 6. Planned operational attitude of MOL during photo-reconnaissance activities (credit: Giuseppe De Chiara; available online in “MOL Unofficial Presentation,” NASASpaceFlight.com, 15 Aug. 2012, http://forum.nasaspaceflight.com/index.php?topic=29467.0;all, accessed 24 Aug. 2012). In other topic areas, we MOL-jonesers have made some arbitrary and literally unsupported assumptions about MOL and its capabilities. One assumption was that there would have been an on-going program of MOL flights, including clusters of modules linked for specific reconnaissance purposes. This is based on artists’ concepts showing such configurations (fig. 7). In fact, the approved program was based on independent flights of 7 modules, one after another: 2 unmanned test flights followed by only 5 piloted missions (10). These would have tested various capabilities for future manned and unmanned reconnaissance systems, but MOL itself was only a test bed, not an extensible architecture (11). Every American and Russian manned spacecraft series has inspired plans for such growth concepts, but—with the notable exceptions of Apollo begetting Skylab and the Apollo-Soyuz mission, and a few one-off Soyuz missions—these concepts have usually gone unrealized. Figure 7. Conceptual growth application of MOL: deployable antenna for signals intelligence or radar imaging (Credit: U.S. Air Force). Another assumption was that the MOL stations could have been revisited and reused (fig. 8). The MOL itself was a limited life item, not reusable (12). After its 30-day useful lifetime, it was to be expended. 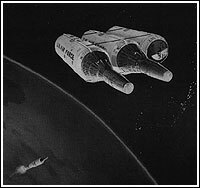 No future Gemini-B vehicles would have been launched to dock with an orbiting MOL and reoccupy it. This was part of the reason that the NRO was not enthusiastic about MOL: its sophisticated telescope system was only to be available for a short time. Figure 8. 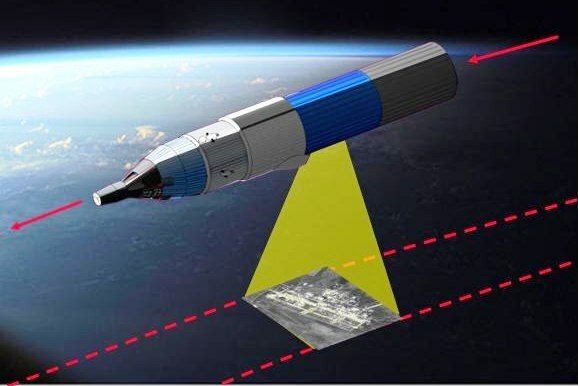 Conceptual growth application of MOL: clustered MOL modules, with one module apparently ready to receive a replacement Gemini-B shown being boosted from Earth (Credit: U.S. Air Force). This limited life was reflected in the means of attaching the Gemini-B to the MOL. 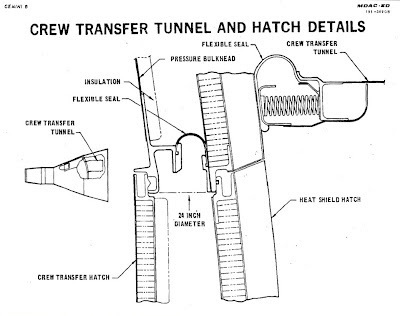 The Gemini-B was to be launched physically bolted to MOL, and the pressurized transfer tunnel was to be sealed by a spring-loaded compression gasket pressed hard against the Gemini-B heat shield at one end (fig. 9), and apparently attached to a flange on the MOL at the other end. There was no reusable docking system for future visits: once the bolts were fractured and the airtight seal permanently broken, the MOL could not have been reoccupied and would have been left to whatever limited capabilities it had without men aboard, perhaps only able to deorbit itself under ground control to avoid somehow falling into the Soviets’ hands. Fig. 9. 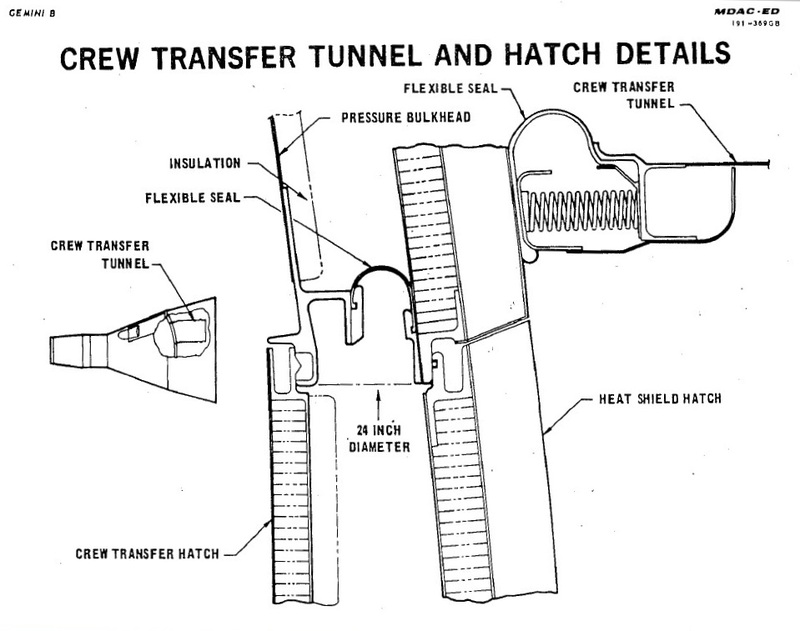 Detail of crew transfer tunnel seal to Gemini-B heat shield using a spring-loaded flexible seal (credit: McDonnell-Douglas Aircraft Co.). As I have learned more about MOL, I have come to understand how ambitious it was for its day, and how restricted it would have been in practice. When it was conceived and planned in 1963, astronauts were flying missions of only a few hours, and then a few days, duration. Re-entry at orbital velocities was a still a challenge, recently but imperfectly demonstrated by Mercury and Vostok capsules, and not without incident (13). Proposing to depend on astronauts performing highly sophisticated tasks adequately for a whole month in weightlessness, and then to re-enter using a heat shield with a hole in it, took organizational courage and self-confidence. MOL was an Air Force project, but orbital reconnaissance was a responsibility of the National Reconnaissance Office (NRO), and by 1966 it was on a path to consolidating its control over all such efforts (9). NRO was already using unmanned satellites and was developing plans to fly MOL unmanned, literally taking the man out of the MOL (fig. 6). That agency would have preferred not to involve MOL pilots selecting ground targets for targets of opportunity for high-resolution photography, when spy satellites were already taking large volumes of targeted photographs (1). In addition, when not actively spying, the off-duty pilots’ movements in MOL would likely jiggle the telescope, blurring the photos. Unlike other “MOL-jonesers,” my primary interest is in other end of the MOL stack, where the human factors would have taken place. They will be the topic of future blog posts. 1. Day, D.A., “All along the watchtower,” The Space Review, Feb. 11, 2008, http://www.thespacereview.com/article/1057/1 (accessed 3 Sep. 2012). 2. Gemini Program Mission Report, GT-3, Gemini 3, MSC-G-R-65-2, NASA Manned Spacecraft Center, April 1965, p. 5-4. 3. “U.S. Air Force Manned Orbiting Laboratory Program,” Fact Sheet, United States Air Force, March 1968. 4. “Astrospies”, PBS NOVA, first U.S. broadcast Feb. 12, 2008, http://www.pbs.org/wgbh/nova/military/astrospies.html (accessed 4 Aug. 2012). 5. Day, D.A., “Astrospies, corrected”, The Space Review, April 14, 2008, http://www.thespacereview.com/article/1104/1 (accessed 4 Aug. 2012). 6. Day, D.A., Gemini for MOL and Circumlunar, NASASpaceFlight.com, http://forum.nasaspaceflight.com/index.php?topic=16145.0 (accessed 20 Aug. 2012). 7. Gordon, T.J., McDonnell Douglas Aircraft Cp., PSAC Briefing, “MOL for NASA”, July 20, 1968, offered by Scott Lowther at http://www.up-ship.com/drawndoc/download/sdoc/sdoc61/sdoc61.pdf (accessed 3 Jan. 2011), password required. 8. Day, D., Re: MOL Unofficial Presentation, 15 Aug. 2012, http://forum.nasaspaceflight.com/index.php?topic=29467.0;all (accessed 24 Aug. 2012). 9. Semi-Annual Report to the Presidents [sic] Foreign Intelligence Advisory Board on the Activities of the National Reconnaissance Program, 1 November 1965 – 30 April 1966, http://www.nro.gov/foia/declass/QUILL/25.%20Semi-Annual%20Report%20to%20the%20PFIAB%201965-66.PDF (accessed 15 July 2012). 10. Normyle, W.J., “Five Orbital Shots Planned in MOL Tests,” Aviation Week & Space Technology, Sep. 12, 1966, pp. 33-4. 11. “U.S. Air Force Manned Orbiting Laboratory Program,” Fact Sheet, United States Air Force, March 1968 (c/o Don Pealor). 12. “30 Day Orbit of MOL Key to AF Space Effort,” Air Force Times, June 21, 1967. 13. Glenn’s Mercury capsule re-entry was marked by concern about a detached heat shield; Carpenter’s, by an alignment error that sent him 250 miles past his targeted splashdown site. Gagarin’s landing capsule failed to separate cleanly from its instrument compartment, causing unplanned and terrifying gyrations during re-entry. ...Heh, Fig.7 reminds me of the old early AWACS joke about how one crew overflew a small nearby town at a significantly low altitude, started throttling the engines oddly, and sent the inhabitants of this sleepy little Mayberry running for their lives, screaming "LORD HELP US! UFOS ARE ATTACKIN' OUR AIRPLANES!!!" A Jones for MOL #3: Down the Hatches!